Check out this story from NBC complete with video, sound, and slides! CATANIA, Italy -- Italy's Mount Etna has erupted for the sixth time in two months. Authorities continued to allow sightseekers on the volcano to take pictures on Monday, despite the lava and steam clouds that spewed from the mountain. The latest eruption caused two lava flows. Experts recorded four different explosions on Sunday. Experts believed that there was no threat to surrounding villages. 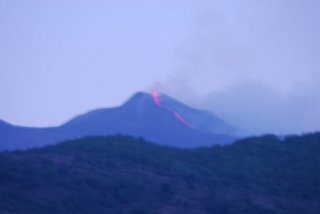 As we were leaving for work this morning and I looked up at Etna, I turned around and ran back into the house to grab my camera. This is the first time I have ever seen a flow in that much daylight. I didn't have time to get out my tripod and set it up, so the picture is a little blurry with the slow shutter speed. At least it will give you an idea of what I saw. Have a beautiful day !!! !